The unintended retention of foreign objects (URFOs) is medical malpractice that can cause serious personal injury or death. It happens when a surgical team leaves any item or foreign object related to the surgery inside a patient. Most common objects left behind are sponges and towels, small device components or fragments, needles and malleable retractors. The risk of URFOs is higher for patients with high body mass index, during emergency procedures or when an unanticipated change happens during the surgery. 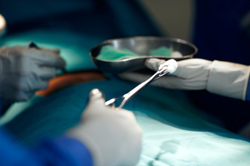 In a recent sentinel event alert The Joint Commission looked at the causes of these surgical errors and recommend strategies for improvement. According to the Commission previous studies show that the risk of URFOs can be greatly reduced by the creation and the adoption by the surgical team of a highly reliable and standardized counting system. Effective communication including team briefings and debriefings as well as appropriate documentation and safe technology are also factors that can reduce this type of medical malpractice.